NOTE: All images are super high resolution when clicked on so they might take a little time to download. Every two years the world comes together for the world`s leading trade fair for transport technology in Berlin, Germany. The whole trains industry, rail network, suppliers and of course the cutting edge train tech of the future. If you’re in the market to purchase a brand new train or you are just addicted to trains, this place is one of the most exciting train shows in the world and we were lucky enough to get an insight into just how great it is and we’d like to invite you for a short tour through InnoTrans 2018. Not only will you get to explore brand new trains, you’ll find anything and everything a railway company needs at InnoTrans. Signs, seats, fabrics, wires, pantographs, signal and track infrastructure, door systems, brakes and even the smallest screws! The fair trade is divided into two parts, the outdoor display and the interior halls covering an area of about 7,000 m². With more than 3,500 meters of track, the Outdoor Display is the highlight of every InnoTrans. More than 140 vehicles were presented on tracks which were located directly adjacent to the exhibition halls. 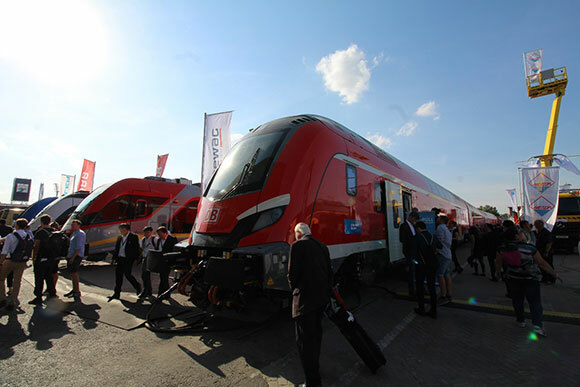 From high-speed trains to hybrid locomotives; from road-rail vehicles to wagons – this was where manufacturers present their new products to the trade public. As the newest technologies are displayed at InnoTran, this is a very good opportunity for other companies to get "inspired" by these ground breaking ideas. One of the most interesting trains at Innotrans was the new glass fibre metro by a Chinese train company. The exterior chassis had (except the bogie) no metal and is operated without a driver. The interior looks futuristic too and it has some special windows. Those windows have integrated displays which can be controlled by touch, fancy! Also their CRRCs booth demonstrates that China is a big player in the railway industry. Also the UK is getting some new trains. Here`s the new sub by Stadler for Glasgow, also operating without a driver. Furthermore a new train by Siemens for the Thameslink. Another train developed by Stadler is the Bi-mode multiple FLIRT unit which can run on electrified tracks but also with a diesel engine which is built within the train. Thats far more than the well known "last mile" solution as it`s a fully working diesel train too. Another diesel hybrid loco of Stadlers "EURODUAL" loco family which has a powerful diesel engine installed too. Another train by Stadler is the new FLIRT 200 (kp/h) train which will be used in regional passenger services for a scandinavian railway company. Even if you are 1.9 meters tall you won`t have any issues to walk in the upper and lower levels. Italy presented two futuristic passenger trains. Hitachi’s "ROCK" and ETR 106 by Alstom. Here are some impressions on "The Rock"
Of course there were a lot of other trains too so here are some more samples. Inside the halls you could talk with other companies to purchase all sorts of rail related items. Here`s some interesting things we found. Virtual reality interiors by Talgo. Next-gen power supplies for passengers. Ever wanted to have your own crossing? Regardless what kind of light you need, these guys have you covered. Possibly a new high-speed train? A modern bogie for heavy freight cars. High speed unibus transportation system designed for max 500 kp/h. Wires, wires and more wires. Things that can shorten the life of your panto. A machine to clean bogies and wheels. Regardless how much heat you are producing there is always a solution. We hope you've enjoyed a little insight into InnoTrans 2018.